It happened this summer that my car overheated in the middle of the highway during rush hour on my way to work. As the steam came pouring out from under my hood, I navigated to the side of the road and got myself pulled over. It was HOT in the Georgia sunshine, already 90 degrees and not even 9 a.m. I was wearing a suit and a tie and standing there on the side of the road with traffic whipping by; I was expected at an important meeting with a VIP client, and I thought to myself, man, this is really going to mess with my plans. But, I also thought to myself, I have a choice. I can choose how I respond in THIS MOMENT. 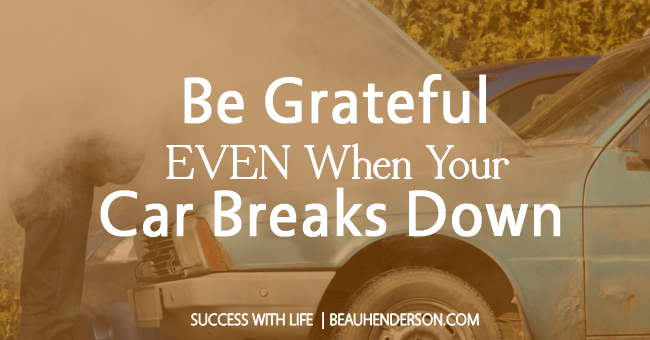 I can choose to be stressed out and angry or I can choose to find calm in the middle of the chaos and be grateful. We make our plans, we do our best to ensure things go right, but then life happens. We don’t always get to pick what happens, but we do get to pick how we respond. I had a choice about how I would respond right then and there on the side of that road. I decided to challenge myself. I told myself, I’m going to find 10 things right now to be grateful for as I’m standing here on the side of the road. Funny thing was, as I looked around for good things and started down my list, more good things kept showing up. I’m grateful that I’m still alive and that no one ran into me as I was pulling over. Even though I’m sweating in it, I’m grateful for this nice suit that makes me feel and look good. I’m grateful for my cell phone that can still make calls. I’m grateful for the roadside assist service covered by my car insurance. I’m grateful that I have car insurance and that I know how to pick out good insurance because of the job I’m in. I’m really grateful that I called roadside assist first because now my cell battery is dead. I’m grateful that my colleague takes this same route to work, and that he recognized me standing here on the side of the road and pulled over. I’m grateful that he’s able to give me a ride, so now, we won’t be late for the important meeting. I’m grateful my car broke down because now, I have an ice-breaker that sets everyone at ease as we settle into our meeting with this million-dollar client. I’m grateful I remembered that I have a choice about how to respond, because today really is turning out to be a great day. Life. How will you respond? Now it’s your turn. We’d love to hear about how you deal with things when they aren’t happening exactly the way you would like them to. Do you panic and get stressed out? Do you take a step away from the situation and look for a way to find calm in the middle of chaos? How does your reaction affect the situation, how does it impact the other people involved? Remember to share as much detail as possible in your reply. Hundreds of RichLifers come here each week for insight and inspiration. Your perspective may ignite a life-changing breakthrough for someone else.